An increasingly rare commodity by the early 1960s, Kid Galahad (1962) is a movie starring Elvis Presley as opposed to an Elvis "vehicle" built around him. Most of Presley's movies were resolutely star vehicles with limited ambitions, fashioned to have Elvis do Elvis stuff: sing a half-dozen songs, ride around in a race car or on a surfboard, get into at least one fistfight and, of course, find time for romance. Kid Galahad, however, is decent enough that one doesn't have to be enamored of Elvis to enjoy it. A remake of Warner Bros.' 1937 charming boxing melodrama about a boxing manager (played in the original by Edward G. Robinson) and the manager's girlfriend (Bette Davis), the remake casts Gig Young and Lola Albright in those roles, with Elvis assuming the part originally played by Wayne Morris. The remake expands Morris's supporting part to accommodate Elvis's star stature, but even so Young's character still dominates the story. The Idyllwild, California locations are attractive, Elvis's songs are good, and the supporting cast is well above average, especially Charles Bronson, who dominates every scene he's in. After being discharged from the army, Walter Gulick (Presley) returns to his hometown, Cream Valley, in upstate New York. (The Southern-accented Gulick explains that while he was born in New York, he was actually raised in Kentucky. Right.) Having no luck finding work as a mechanic, he agrees to spar with an up-and-coming boxer at Willy Grogan's (Gig Young) training camp. Gulick's boxing impresses trainer Lew Nyack (Charles Bronson) while his polite manner and gentlemanly ways earns him the nickname "Galahad" from Dolly (Lola Albright), Willy's long-suffering girlfriend. Willy, it seems, is something of a loser, heavily in debt with his bookie and under pressure from an assistant district attorney (an uncredited Ed Asner in his second film appearance) to testify against gangster Otto Danzig (David Lewis, in a part played by Humphrey Bogart in the original version). Matters are complicated further when Willy's sister, Rose (Joan Blackman), falls for Galahad. Somewhat peculiarly, many of Elvis' movies from this period cast him either as angry (and often irritating) young men types, homogenized James Deans forever picking fights, whining about their troubles, and badly treating those who try to help, particularly woman in love with him; or as care-free ne'er-do-wells, living fast and dangerously with a gaggle of girlfriends until one comes along with the patience to tame him. Galahad is neither of these: Elvis' character is simply a decent chap that plays very close to the kind of person Elvis apparently really was off-screen. Modest, unpretentious, and well-mannered, "Galahad" is old-fashioned in the good sense, the kind of young man any girl would be proud to bring home to Mom and Dad, even if he does swivel his hips when he sings. The result is both Elvis and his character come off as eminently likable, while the story's plot and conflict are driven mainly by Willy's problems with the gangsters and his fed-up girlfriend. The former is generic and overly familiar, and David Lewis is no Humphrey Bogart though Richard Devon is very good as one of Danzig's torpedoes. Willy and Dolly's weary relationship is likewise a cliché, but the actors make it work for the most part. Albright brings to her part a Barbara Stanwyck-esque worldliness, she all too aware of her boyfriend's shortcomings and ready to bolt. Young, who really carries the film on his shoulders more than Elvis does, had played breezy romantic leads (or third wheels) for years but casting directors eventually tapped into a darker, melancholy facet of the actor, put to best use in "Walking Distance," a candidate for the best-ever episode of The Twilight Zone, and culminating with his deeply disturbing role in They Shoot Horses, Don't They? (1969). In Kid Galahad, the slightly darker nature of that character is unintentionally accentuated by Young's real-life personal problems (his marriage to actress Elizabeth Montgomery was ending) and especially his alcoholism: he's very clearly intoxicated in some scenes (most obviously his initial confrontation with Lewis's gangster), slurring his lines and unsteady on his feet, though Young tries to hide it. In another scene all of Young's dialogue is looped (rerecorded), probably because his on-set line readings were unintelligible. Though the character he plays barely touches a single mug of beer, the story of Willy's salvation benefits from Young's prolonged, tragic decline. The real surprise for some watching Kid Galahad is the quietly understated support of Charles Bronson, who during this time flirted with but never quite attained stardom, despite knockout supporting parts in movies like The Magnificent Seven (1960) and The Great Escape (1963). Billed fifth, Bronson's enormous screen charisma takes command of every scene he's in, even those opposite Elvis. 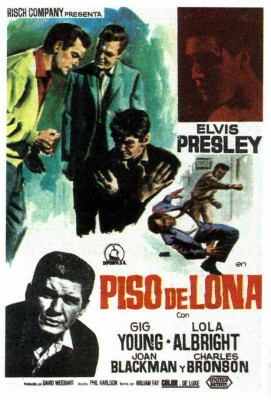 The script offers the actor several chances to show what would eventually make him a huge star in Europe and, some time later, the U.S. One sequence especially anticipates Bronson future roles: when Danzig and his men threaten him, tough guy Lew allows his hands to be broken rather than cede to their demands. Director Phil Karlson was generally a hack who got his start helming low budget dreck for Monogram before graduating to bigger if similarly unambitious studio product. Still, he handles the boxing scenes quite well, even incorporating a hand-held camera for some energetic angles, somewhat unusual in 1962. Twilight Time's Blu-ray, licensed from MGM, is a big improvement over the latter previous enhanced widescreen DVD. The added clarity of Kid Galahad, in 1080p and its original 1.85:1 widescreen, enhances the performances and shows the picturesque mountain resort locales to excellent advantage. Optional English subtitles are included with the 1.0 mono DTS-HD Master Audio, which is excellent. Region-free and a limited (3,000 units) edition. The Blu-ray offers a trailer that was absent from the DVD release. Also included are an isolated music & effects track, and Julie Kirgo's usual booklet essay. Kid Galahad is a pretty good film, different enough from the original to stand on its own merits. The old-fashioned story (sentimental even by 1937 standards) is as engaging as are its likeable characters, and the climatic bout is exciting even though there's no doubt how it'll all end. Highly Recommended.